Heat oven to 350°F. In 10-inch nonstick skillet, cook chicken, stirring occasionally, until browned. Stir in water, seasoning mix and seasoned rice & beans (from dinner kit). Heat to boiling over medium-high heat, stirring occasionally. Reduce heat to medium. Cook uncovered 9 to 11 minutes, stirring frequently, until almost all liquid is absorbed and rice is tender. Remove from heat. Spray 9-inch round (3-quart) glass baking dish or casserole with cooking spray. Cut tortillas (from dinner kit) in half. Layer 4 of the tortilla halves in bottom of baking dish. Top with half (2 cups) of the chicken mixture. Top with 4 tortilla halves. Spoon corn over tortillas. Spread half of the enchilada sauce over corn. Sprinkle with 1 cup of the cheese. Top with 4 tortilla halves. Top with remaining chicken mixture. Continue layering with remaining tortilla halves, enchilada sauce, cheese and onions. 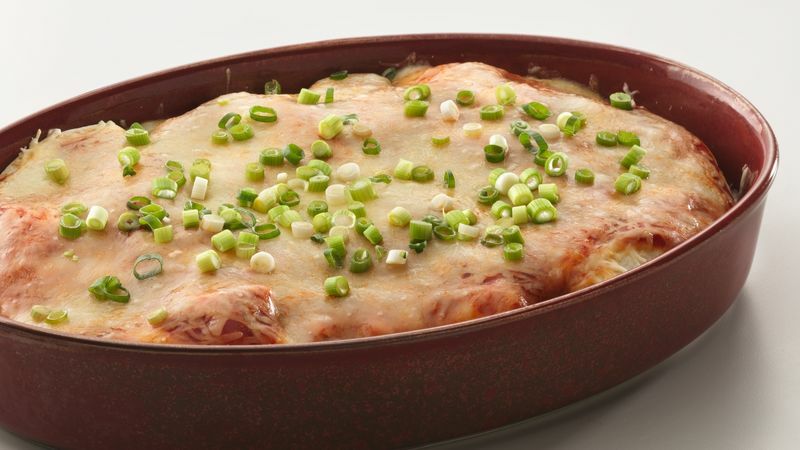 Bake 35 to 45 minutes or until mixture is hot and cheese is melted. Cool 5 minutes. Top with sour cream. One pound of lean ground beef or pork sausage can be substituted for the chicken—brown as you would the chicken and continue as directed in the recipe. Serve a crisp green salad and a basket of corn or tortilla chips with this Tex-Mex main dish.